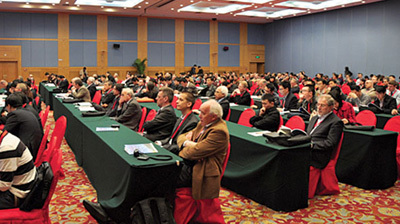 The 2010 Asia-Pacific International Symposium on Electromagnetic Compatibility (APEMC) was held from April 12 to 16, 2010 at the Beijing International Convention Center with the theme of “EMC Harmonizes the World.” This event addressed the needs of a rapidly rising EMC community in the Asia-Pacific region while promoting excellence and warm relationships amongst the EMC community. The 2010 APEMC Symposium was lead by the president, Professor Jinliang He, an IEEE Fellow from Tsinghua University in Beijing. Professor He also received the IEEE EMC Society’s Technical Achievement Award at the recent 2010 IEEE International Symposium on EMC held in Fort Lauderdale, Florida. With the fabulous Chinese organizing team, APEMC 2010 was a resounding success. 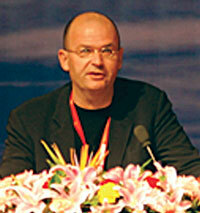 APEMC 2010 has further strengthened the Asia-Pacific EMC foundation and extended its influence worldwide. The Symposium has been the largest EMC event in China, which provided an opportunity to bridge the EMC community in China and the World. Over 700 delegates from 43 countries and regions, including 300 foreign delegates outside Mainland China, attended this event, which makes the APEMC a truly global conference. In addition, 68 exhibitors were co-located with the APEMC 2010. The opening ceremony took place in the morning of April 13, attended by over 700 delegates and invited guests. The Symposium was officially declared “open” by the Guest-of-Honor, Professor Zhuan Li-jun, Deputy President of Tsinghua University. Professor Jinliang He gave a welcome address as did the President of the IEEE EMC Society, Professor Francesca Maradei. The General Chair, Professor Erping Li, outlined the APEMC history and future, and the Technical Program Chair, Professor Todd Hubing, outlined the technical program of the Symposium. 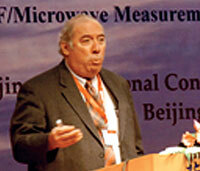 The Symposium committee invited the former President of the IEEE Electromagnetic Compatibility Society, Professor Todd Hubing of Clemson University in the USA, to be the Chairman of the Technical Program Committee (TPC), and another 67 global well-known experts to be TPC members. The President of IEEE EMC Society, Professor Francesca Maradei, presenting her address at the opening ceremony. In conjunction with the technical sessions, a total of 11 workshops and seven tutorials sessions were conducted on Monday, April 12 and Friday, April 16, which were organized by 44 internationally renowned EMC specialists. Eighteen Special Sessions were organized by famous EMC experts, including “EMC Test and Measurement” by Dr. Wen Lie Liang of QuieTek Corporation and Professor Han-Nien Lin of Feng Chia University, Chinese Taipei; “Recent Progress in EMC Numerical Modeling” by Dr. Qingsheng ZENG of the Communications Research Centre Canada; “EMC Computer Modeling and Simulation” by Professor Junwei Lu of Griffith University, Australia; “Recent Progress in Modeling and Simulation for EMC” by Professor Francesca Maradei of Sapienza University of Rome, Italy: “Numerical Modeling for Complex EMC Systems” by Professor Ji Chen of the University of Houston, USA, and Dr. Bruce Archambeault of IBM, USA; “Effects and Protection of Intentional Electromagnetic Interference” by Dr. William Radasky of Metatech Corporation, Goleta, California, USA and Professor Wen-Yan Yin of Zhejiang University, China; “EMC in Mobile Phones” by Dr. Huang Jingyu of Nokia Mobile Phone Device R&D Beijing, China; “Automotive EMC – EMC Solutions for New Automotive Technologies” by Professor Stephan Frei of the Technische Universität Dortmund, Germany; “Modeling and Analysis of Packaging Structures for EM Reliability” by Dr. Ivan Ndip of Fraunhofer IZM, Germany; “Biomedical EMC” by Dr. C.-K. Chou of Motorola Inc. USA, Professor Ji Chen of the University of Houston, USA, and Professors Osamu Fujiwara and Jianqing Wang of the Nagoya Institute of Technology, Japan; “ESD and Transients” by Professors David Pommerenke of the Missouri University of Science and Technology, USA, Osamu Fujiwara of the Nagoya Institute of Technology, Japan, and Dr. Ken Kawamata of the Hachinohe Institute of Technology, Japan; “Signal and Power Integrity for Multi-Gbps Digital Circuits” by Professor Jun Fan of the Missouri University of Science and Technology, USA, Professor Antonio Orlandi of the University of L’Aquila, Italy, and Dr. Bill Chen of Cisco, USA; “EMC Research and Development” in Taiwan by Professor Ching-Wen Hsue of the National Taiwan University of Science and Technology, Chinese Taipei; “Overview of EMC in Europe” by Professor Marcello D’Amore of the University of Rome La Sapienza, Italy; “Model Validation for EMC Simulations” by Professor Franz Schlagenhaufer of the University of Western Australia, Australia; “EMC and Solution of Power Electronics” by Professor Zhengming Zhao of Tsinghua University, China; “Electromagnetic Environment of Power System” by Professor Xiang Cui of North China Electric Power University, China, Dr. W. H. Siew of University of Strathclyde, UK, and Professor A.P.J. van Deursen of Eindhoven University of Technology, Netherlands; and “Advances in Radiated Measurements” by Zhong Chen of ETS-Lindgren, USA. One Industry Forum “Emission Measurements – Novel and Alternative Methods” was organized by Dr. Stephan Braun of GAUSS Instruments GmbH, Germany. Two topical meetings were presented, including a “Topical Meeting on Lightning Protection” by Professor Vladimir A. Rakov of the University of Florida, USA, Dr. S. Yokoyama of the Central Research Institute of Electric Power Industry (CRIEP), Japan, and Professor Farhad Rachidi of Swiss Federal Institute of Technology – Lausanne, Switzerland. The second presentation was “Topical Meeting on Advanced Research in EMC of ICs” by Dr. Sonia Ben Dhia of INSA de Toulouse, France, and Dr. Thomas Steinecke of Infineon, France. giving his plenary speech. Dr. Sonia Ben Dhia, INSA de Toulouse, France, chairing her Topical Meeting on Advanced Research in EMC of ICs. Technische Bundesanstalt in Germany joined Zhong Chen and Janet O’Neil of ETS-Lindgren USA at the Symposium Opening Session. 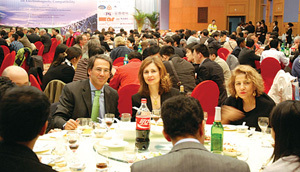 Warm discussions were held during the Symposium dinner banquet at the Beijing International Convention Center. Wushu give a traditional Chinese performance during the Symposium dinner banquet. 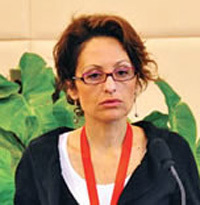 The opening ceremony on the morning of April 13, 2010 attracted a large audience. had to get their cameras out to record the impressive activity on stage. The APEMC 2010 organizational support team headed by Professor Jinliang He. 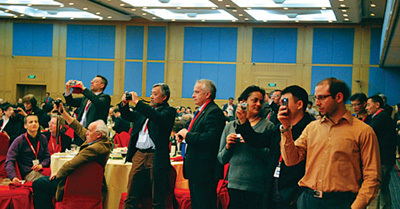 The Symposium dinner banquet took place on April 14 at the Beijing International Convention Center. The Best Symposium Paper and Best Symposium Student Papers were presented at the dinner, and a two-hour Chinese traditional performance was presented. The performance included three different Chinese folk dances, Jiangnan opera, magic, acrobatics, folk music, Kung Fu, Sichuang opera-changing faces, and Peking Opera. Every attendee deeply enjoyed the performances. 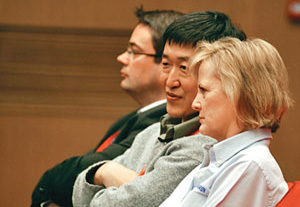 Professor Jinliang He and Professor Erping Li with Professor David Pommerenke (far left), Dr. Jun Fan (second from right), and Professor James L. Drewniak (far right) from the Missouri University of Science and Technology, USA. From left to right: Symposium General Chair Professor Erping Li, General Co-chair Dr. Jie Zhao, Co-president Mr. Wenliang Zhang, with the plenary speakers Professor Niels Kuster, IEEE EMC Society President Professor Francesca Maradei, Technical Program Chair Professor Todd Hubing, and Symposium President Professor Jinliang He. Some of the famous lightning experts in the world convened at APEMC 2010, including from left Professor A. Ametani, Dr. P. Lecomte, Dr. S. Yokoyama, Professor M. Bouquegneau, Professor V. Rakov, Professor Jinliang He, Professor S. Grzybowski, Professor M. Loboda, Professor Z. Kawasaki, and Professor M. Ishii. The IEEE EMC Society, together with several other cooperating Societies, provided technical co-sponsorship. 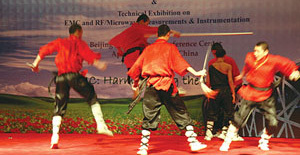 The Symposium also received sponsorship from China EPRI, China Southern Power Grid Technology Research Center (CSG TRC), China NSFC, Henan Pinggao Electric Co., AR RF/MICROWAVE INSTRUMENTATION, China State Grid Electric Power Research Institute, Lightning Protection Center of Guangdong Province, Chinese Society for Electrical Engineering (CSEE), and the IEEE Singapore EMC Chapter.